. 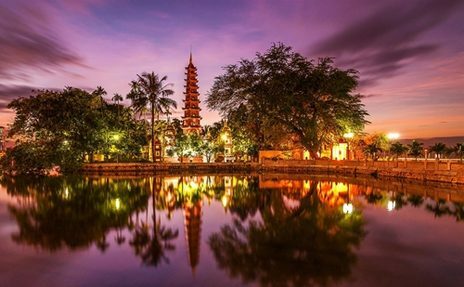 (News) Tran Quoc Pagoda in Hanoi, the capital of Vietnam, has just been rated by the UK tourism website, wanderlust.co.uk, as one of the ten most beautiful pagodas in the world. The Vietnamese pagoda ranks third on the list. The website touted that Tran Quoc Pagoda has an incredibly beautiful view. This is not the first time that a foreign website has honored Tran Quoc Pagoda. In 2016, the Daily Mail of the UK also listed Tran Quoc among one of the 16 most beautiful pagodas in the world. Seen as a green island in the blue water of West Lake, Tran Quoc Pagoda is the most sacred pagodas not only for its landscape, but also for the fact that it has stood there witnessing various upheavals along the course of the national history, the history of Hanoi, and the history of Buddhism.